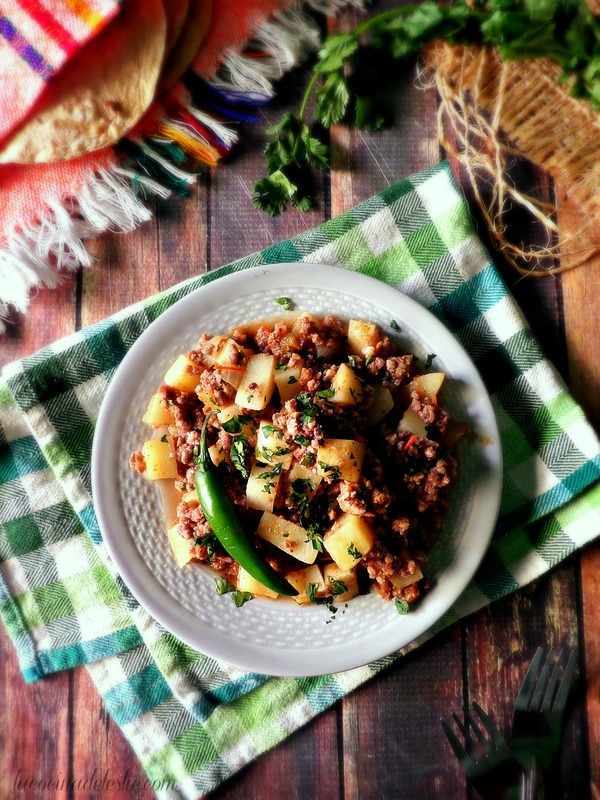 This super easy Mexican picadillo ranchero is made with a combination of ground beef and pork, along with tender pieces of potato simmered in an onion, garlic, tomato, and serrano chile broth. Picadillo is a comfort food classic in every Mexican kitchen whether you're in the US or Mexico! 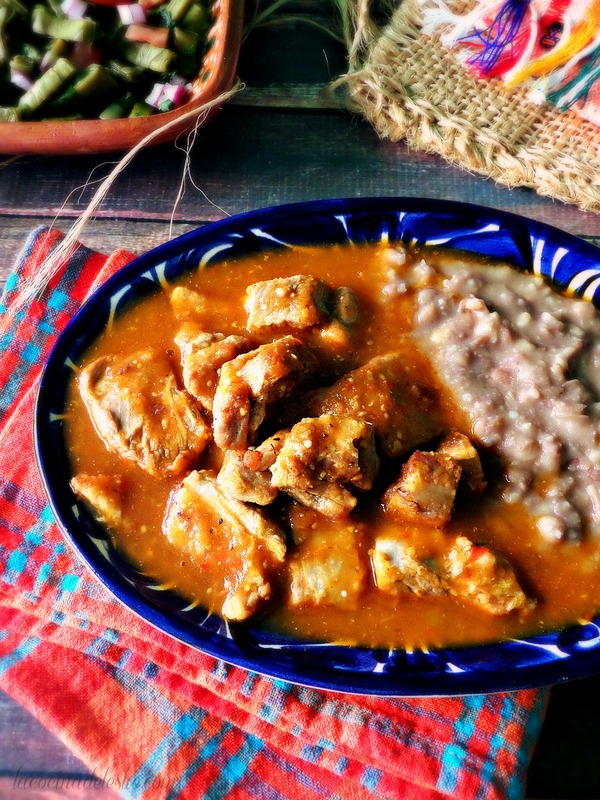 It's one of those Mexican recipes that varies from family to family. I have about six different picadillo recipes--including my suegra's Shredded Beef (de bistec) and my abuelito's Ground Beef Picadillo w/ Veggies--in my repertoire, and even then I'm always tweaking the recipes by either switching up the sauce or the veggies, so I never make my picadillo the same way twice. 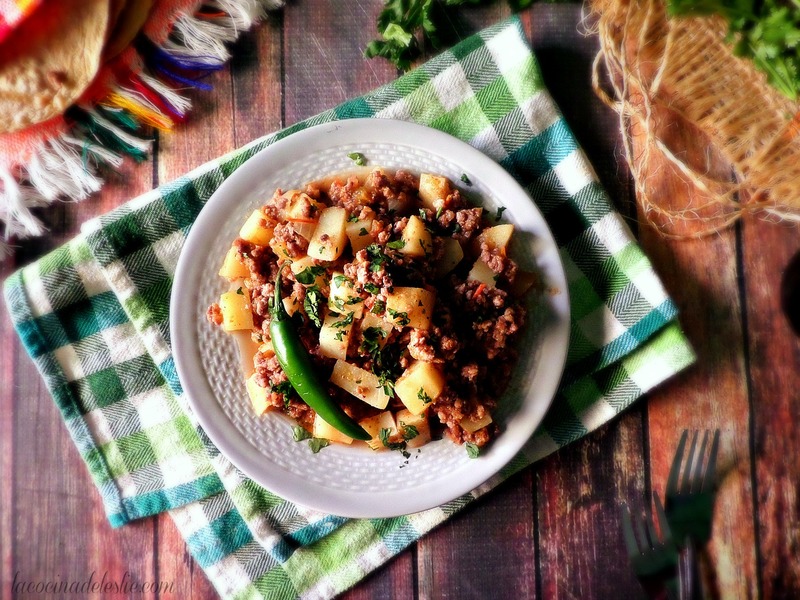 Except for this super easy picadillo ranchero with potatoes. Picadillo ranchero, which really is the easiest picadillo ever, is one my suegra taught me how to make and it has always been one of my "go to" recipes for when I need to get lunch (our biggest meal of the day in Mexico) on the table. 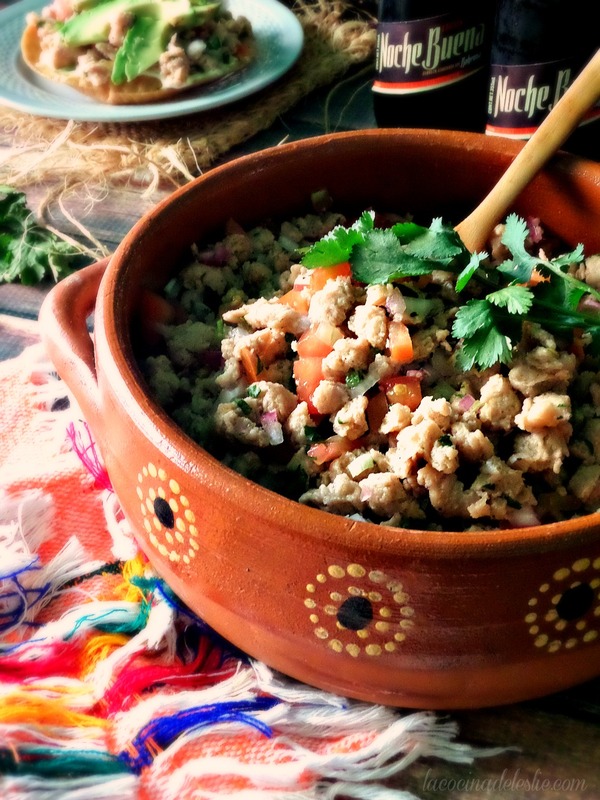 If you love simple, uncomplicated recipes, then this is the picadillo for you. 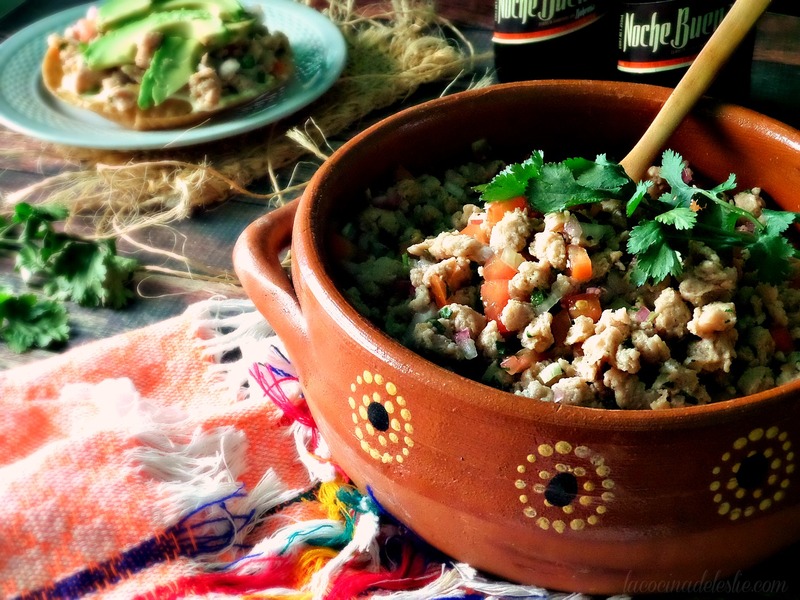 You can serve picadillo ranchero on it's own with plenty of warm corn tortillas. 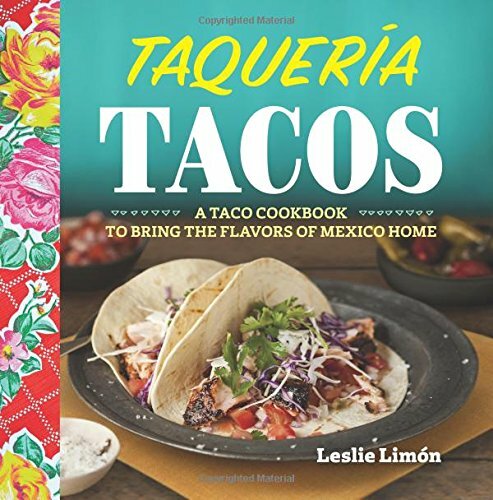 Or you can serve it as a filling for tacos, burritos, tortas, sopes, gorditas, enchiladas, chiles rellenos, and even tamales. The possibilities are endless. Puree the tomatoes, serrano chiles, garlic, onion, and water in a blender until smooth; set aside. Sauté the ground beef and pork in the vegetable oil over high heat until lightly browned; season with salt and black pepper. Stir in the potatoes and tomato puree; season generously with salt and black pepper to taste. Add in a couple of sprigs of fresh cilantro. Bring to a boil over high heat. Cover and reduce heat to low; let simmer for about 20 minutes until the potatoes are cooked through and almost all of the liquid has evaporated. Serve with warm corn or flour tortillas. Buen provecho! Camarones al mojo de ajo is a traditional Mexican dish made with tender pieces of shrimp simmered in a sumptuous butter and garlic sauce. Cuaresma is upon us and it's time to make all of our meatless and seafood favorites, because many of us living in Mexico refrain from eating meat on Fridays during Lent. I love any and all shrimp dishes, but my all-time absolute favorite is Camarones al Mojo de Ajo (Mexican Garlic Shrimp). 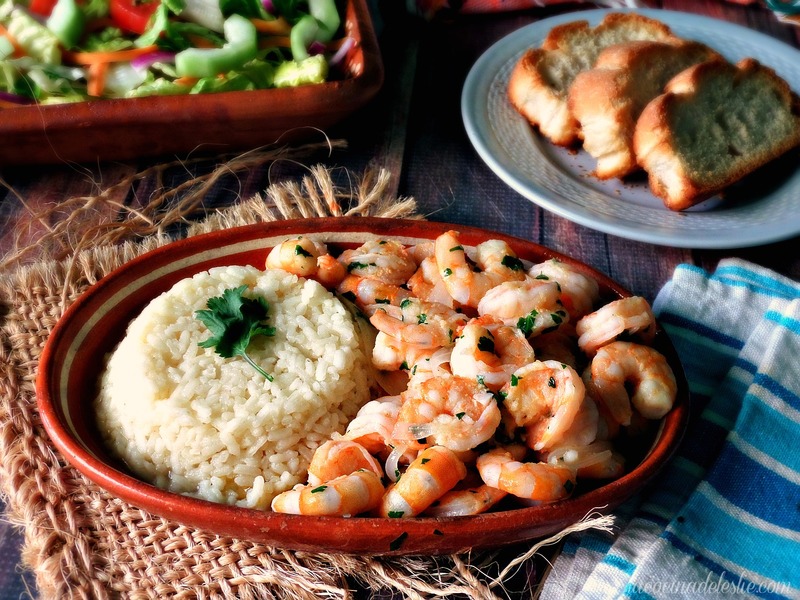 This is one popular Mexican shrimp dish that you will find on the menu at any Mexican mariscos restaurant. Making Camarones al Mojo de Ajo at home is unbelievably quick and easy. All you need is butter, onion, garlic, shrimp, and parsley or cilantro. 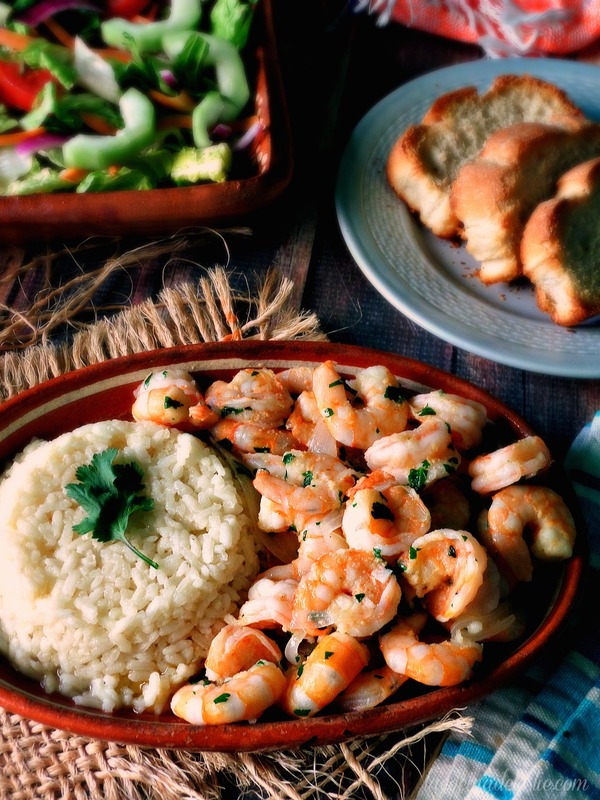 That's it... just five ingredients to make this traditional Mexican shrimp dish. My least favorite part of cooking with shrimp is having to peel and devein them, so sometimes I leave the camarones unpeeled. Because half the fun of eating any Mexican shrimp dish is sucking on all of the delicious sauce. That is why when ordering a shrimp dish at any local mariscos restaurant, they ask if you want your shrimp pelado (peeled) o sin pelar (unpeeled). Camarones al mojo de ajo is a tantalizing Mexican dish made with tender pieces of shrimp cooked in a sumptuous butter and garlic sauce. Melt butter in a large skillet over high heat. Saute garlic and onion for 2 to 3 minutes until onion turns translucent. Stir in shrimp; season lightly with salt. Let cook for 3 to 5 minutes until all the shrimp have turned pink. Cover, reduce heat to low, and let simmer for 3 to 5 minutes. Stir in the chopped fresh parsley or cilantro. Stir gently to combine. Remove from heat. Serve with toasted bread slices, Arroz Blanco, and a green salad. Buen provecho! Ceviche de Soya, made with texturized soy protein, is a tasty and refreshing alternative perfect for meatless Mondays or Lent Fridays. Soya (texturized soy/vegetable protein) is a very popular ingredient here in Mexico. Not only is it a great alternative to meat, it's also budget-friendly and it's easy to store in your pantry. I use soya (TVP) most during Cuaresma (Lent). It's quick and easy to prepare, and is a perfect substitute for ground meat if your budget is tight or you're simply trying to eat more meatless meals. And best of all, it's super versatile. Some of my favorite ways to prepare soya is in carne adobada for tacos al pastor, sloppy Jose's, and picadillo. But my favorite way to enjoy soya in a cool and refreshing Ceviche. Made with finely chopped fresh tomatoes, onion, serrano chiles, and freshly squeezed lime juice, Ceviche de Soya is perfect for a light lunch or no-fuss dinner. If you've never tried texturized soy/vegetable protein, this soy ceviche is the easiest and most flavorful way to enjoy it. Like most ceviches, serve Ceviche de Soya atop crisp tostada shells and garnish with avocado slices and a few drops of your favorite bottled hot sauce. And while you're at it, serve yourself a tall glass of ice cold Agua de Jamaica or pop open a bottle of your favorite Mexican beer. To cook the soya, place onion, garlic, cilantro and bouillon cube in a large saucepan. Pour in the water. Bring to a boil over high heat. Reduce heat to low and let simmer for 5 minutes. Remove from heat. Using a slotted spoon, remove and discard the onion, garlic, and cilantro. Add the dried soya to the hot broth. Stir gently to combine. Cover and let soak for at least 10 minutes until the soya is completely hydrated. Drain and let cool completely. In a large serving or mixing bowl, add the drained and cooled soya, the tomatoes, onions, serrano chiles, chopped cilantro, and the lime juice. Stir gently to combine. Season with coarse salt to taste. Cover with plastic wrap and refrigerate for at least 2 hours before serving. To serve, spread tostada shells with a little mayonnaise or Mexican crema, if desired. Top with a few heaping tablespoons of ceviche de soya. Garnish with avocado slices and a few drops of your favorite bottled hot sauce. ¡Buen provecho! This hearty Mexican meatball soup with veggies simmered in a clear broth is just what you need when you're in the mood for some good old-fashioned comfort food like your abuelita used to make. 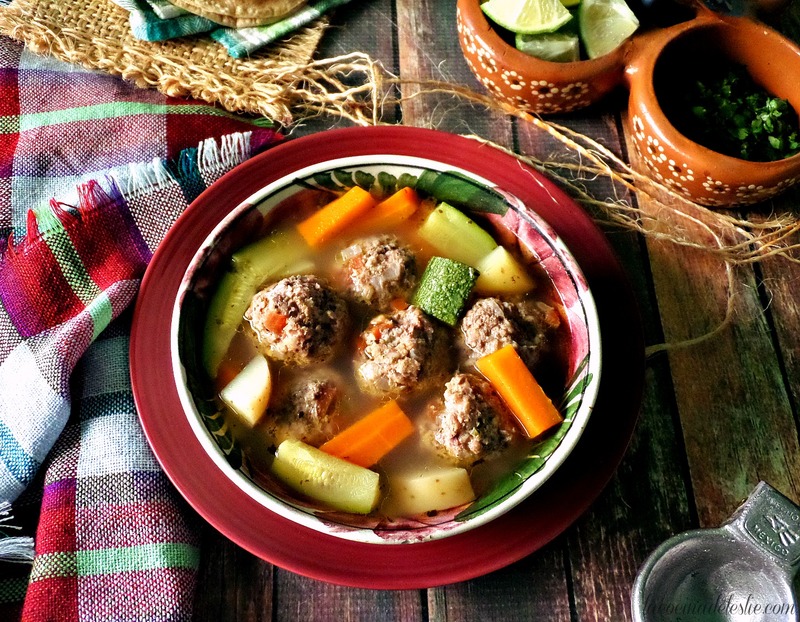 Albóndigas en Caldo is a traditional Mexican meatball soup simmered with carrots, potatoes, and calabacitas (zucchini) in a clear broth. It's a comforting soup for when you're craving a home-cooked meal or something to warm you up on a cold winter's day. And it's also my all-time favorite soup. 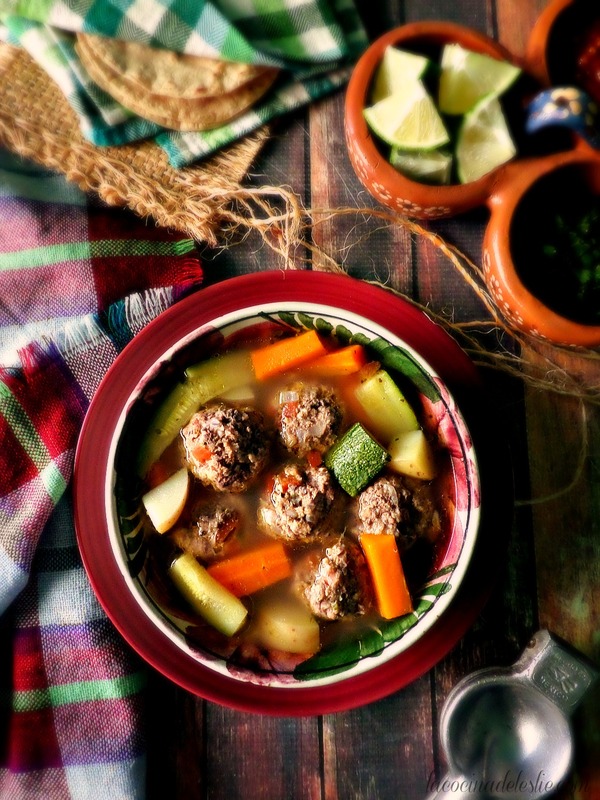 The flavor-packed albóndigas made with lean ground beef, onion, tomato, garlic, serrano chile, and oregano add a ton of flavor to the clear broth, which is also seasoned with a little extra oregano and fresh cilantro. Once the soup is served, don't forget to garnish with chopped cilantro, a squeeze of fresh lime juice, and a spoonful of your favorite salsa. Two of my favorite salsas include my Chile de Molcajete (roasted tomatillo & árbol chile salsa) and Salsa Macha (an oil-based garlic & árbol chile salsa). And don't forget to have plenty of warm corn tortillas on hand. I will forever remember the first time I attempted to make albóndigas on my own. It was one of my biggest kitchen fails ever! I cooked one pound of meatballs in about ten quarts (40 cups) of water. (The recipe I'm sharing today calls for 2-1/4 pounds of meatballs in 16 cups of water.) No amount of salt or beef bouillon was enough to season the insane amount of water I added to my soup. And I also went a little overboard on the oregano. As I was adding a sprinkle of oregano to the broth, the stopper fell out and out poured at least half a bottle of oregano. It was a horrific mess! And to make matters worse, I was expecting company for dinner and had no other food in the house to feed them. Thankfully we ended up ordering pizza, and my friends were no-show's to dinner. But, as we say in Spanish, "La practica hace al maestro." (Practice makes perfect.) It took me a couple of attempts, but I finally mastered my albóndiga recipe which borrows elements from both my grandparents' recipes and my suegra's. I add old-fashioned oats to my albóndiga mixture as an added binder, just like my abuelito used to do, I also add chopped onion and tomato like my suegra taught me, and I always add lots of veggies just like my grandma. 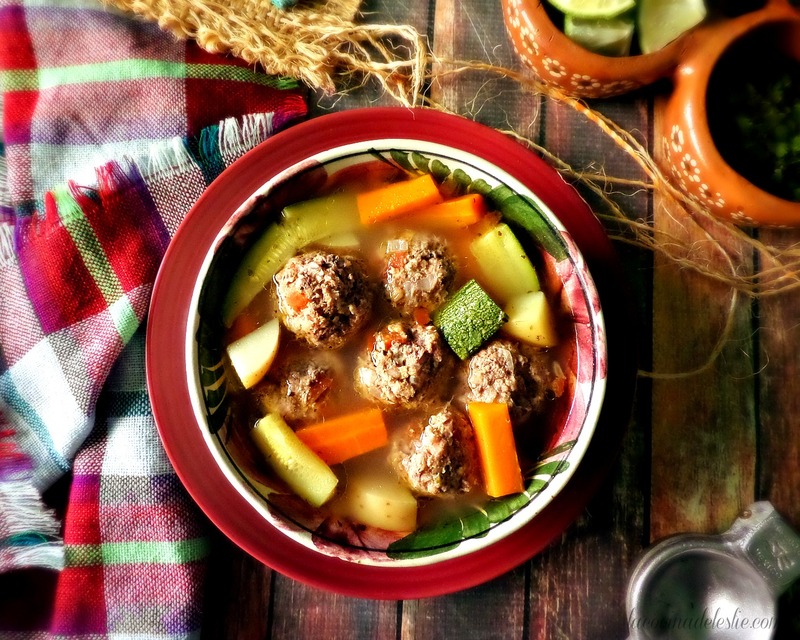 This hearty Mexican meatball soup with veggies simmered in a clear broth is just what you need when in the mood for some good old-fashioned comfort food like your abuelita used to make. Combine the ground beef, rice, oats, and dried bread crumbs in a large mixing bowl; season with salt, black pepper, and crushed Mexican oregano. Stir in the eggs, tomatoes, onion, garlic, and serrano chile until completely combined. Divide and shape meat mixture into 1-1/2-inch meatballs. In a Dutch oven or in stock-pot, pour in 16 cups of water. Carefully drop in the albóndigas, one at a time. Resist the urge to stir! (You don't want to break up the albóndigas.) Add a handful of fresh cilantro. Bring meatballs to a boil over high heat, skimming off any foam that rises to the top. Cover and reduce heat to low: let simmer for about 20 minutes. Add the carrots and potatoes. Remember not to stir! Season broth with crushed Mexican oregano and coarse salt to taste. Cover and let simmer over low heat for 15 minutes. Add in the Mexican calabacitas. Taste broth and adjust seasoning, if necessary. Cover and let simmer for about 15 minutes until the calabacitas are cooked through. To serve, ladle into bowls. Garnish with chopped fresh cilantro, a spoonful of your favorite salsa, and a squeeze of fresh lime juice. Serve with plenty of warm corn tortillas. 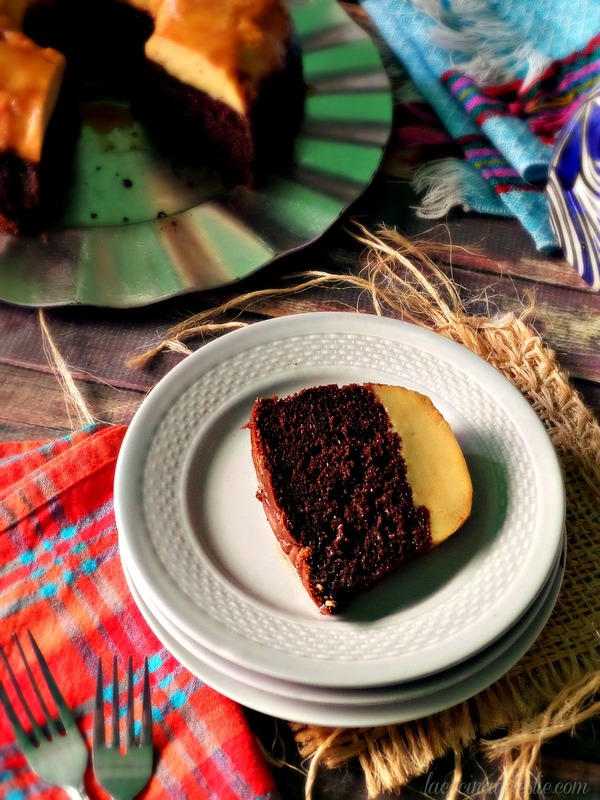 Chocoflan, or Pastel Imposible, combines two irresistible desserts into one: rich chocolate cake and creamy vanilla-flavored flan. Happy New Year, friends! This year I've decided against New Year's resolutions. Well, maybe not entirely. I do have one small New Year's resolution, and once you hear what it is, I'm sure you'll agree it's the best New Year's resolution ever. Inspired by the old addage of, "Life is short, eat dessert first!"... My one resolution for 2018 is to bake more desserts. At least once a week. 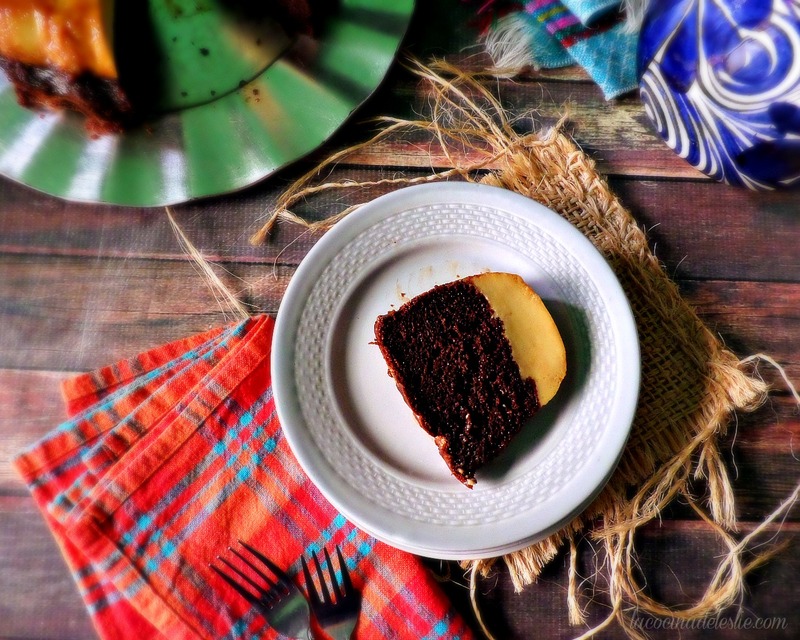 To kick off my New Year's resolution, I'm sharing this classic Chocoflan, a fun and flavorful dessert that combines the richness of a chocolate cake with the light creaminess of a tradtional flan. This is one of those dessert recipes that is perfect for when you want to impress guests with an elegant dessert that looks like it took hours for you to make, but you won't believe how incredibly easy it is to prepare. If you can make a cake mix cake, then you'll have no problem whipping up a Chocoflan. Chocoflan is also known as Pastel Imposible, but this cake is pure magic. You start by layering the cake batter and then the flan mixture into a Bundt pan, but during the baking process, the flan mixture seaps through the cake batter to the bottom of the pan, so when you turn your finished Chocoflan onto a serving platter, the flan magically appears on top of the cake. Sounds impossible, but it's not. It's magic! Preheat oven to 350°F. Lightly spray a 12-cup Bundt pan with cooking spray. Drizzle the Mexican cajeta along the bottom of the Bundt pan, swirling lightly to coat. In a medium mixing bowl, combine the cake mix, water, vegetable oil, and eggs. Beat with an electric mixer on low speed for about 30 seconds, just until combined. Increase speed to high and beat for about 3 minutes until cake mix is thick and creamy, like a chocolate milkshake. Pour batter into Bundt pan over the cajeta. DO NOT STIR! For the flan, puree the sweetened condensed milk, evaporated milk, eggs, and vanilla extract in a blender until smooth. Gently pour the flan mixture into the Bundt pan, over the cake mix. Again, resist the urge to stir. Place the Bundt pan inside a larger baking pan. Fill the larger baking pan about halfway with boiling water. Bake the chocoflan at 350° for 45 minutes. Remove from heat. Let cool completely. Turn chocoflan onto a serving platter. Refrigerate until ready to serve. Enjoy! 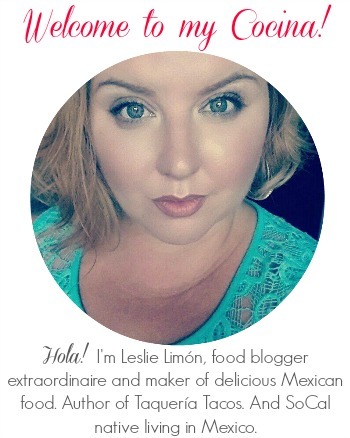 *Originally posted back in March 2010 to celebrate my 100th recipe here in my cocina. The recipe and instructions remain the same, all I've done is update the photos and added a printable recipe card. 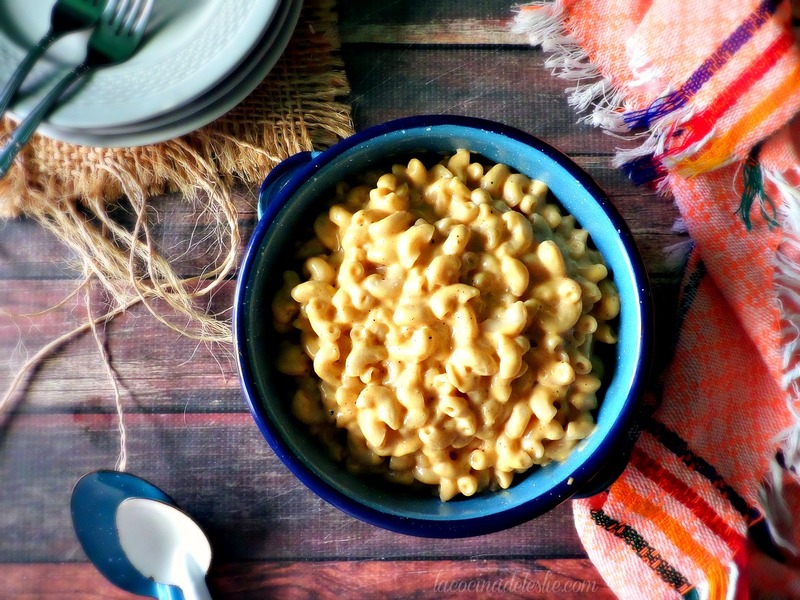 Irresistible homemade Macaroni and Cheese made with American cheese, butter, and Mexican crema. I have a confession to make. When Hope was two years old, I introduced her to a new food, that quickly became her favorite...Macaroni and Cheese. But not just any macaroni and cheese, it was the kind that comes in a blue box. She loved it! And every time we went to the grocery store, she would spot the blue box and scream "Mac-Cheese". 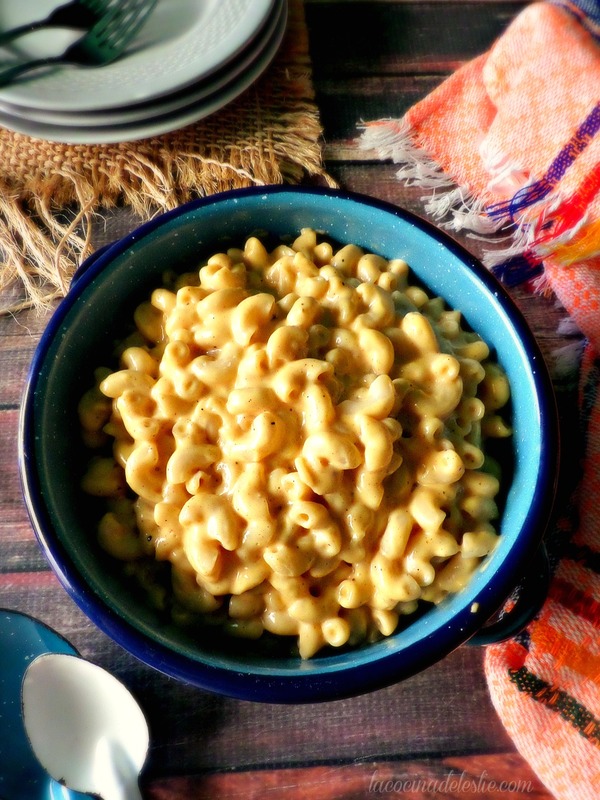 Whenever I wasn't sure of what to make her for lunch or dinner, she would say "Mac-Cheese!" She was crazy about the stuff. Fast forward to almost a year later, when we moved to Mexico. Sure, Hope liked the food that my suegra prepared for her, but she still wanted her mac & cheese. This being a small town, far from the big city and large grocery stores, the stuff in the blue box was no where to be found. I did buy a few boxes of the different Mexican brands, but none of them came close to the yummy goodness of the stuff in the blue box. Then began my desperate search for the perfect homemade version. Some were baked. Some had a bechamel sauce base. But still, I hadn't found a recipe that was pleasing to my little girl's taste buds. Finally, one day, I really didn't feel like making yet another bechamel sauce, so I decided to use a few shortcuts. I cooked my macaroni according to package directions. Then in a separate bowl, I melted a little bit of butter, added some Mexican crema, a splash of milk, and oodles of good ol' American cheese. To finish it off, I seasoned it with salt, pepper, and paprika before presenting it to my princess, Hope. 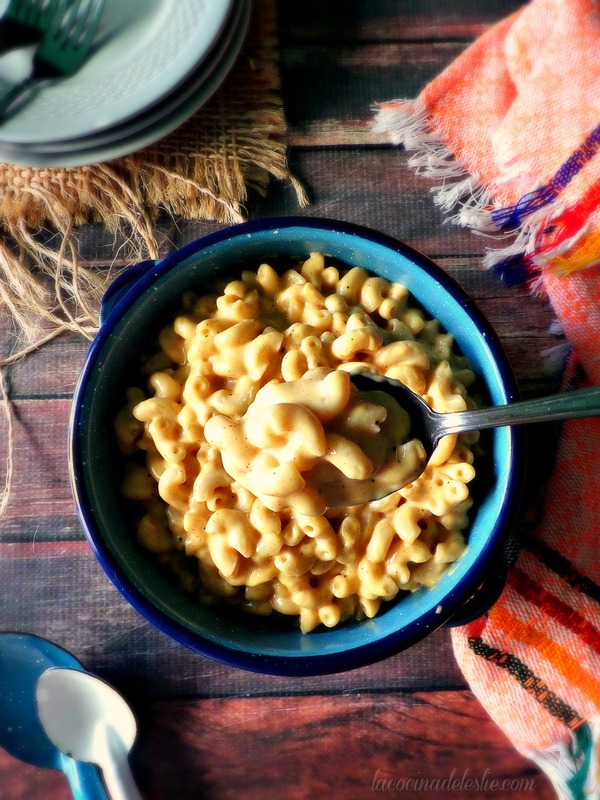 I waited with bated breath as she tasted this easy stovetop macaroni and cheese. She turned to me with a very serious look, then flashed me the biggest smile and said, "Mommy, this is the BEST mac & cheese EVER!" And I've made it the same way ever since. Cook macaroni pasta according to package directions; drain and rinse with with cold water. Melt butter in a medium saucepan over medium heat. Stir in Mexican crema, milk, and American cheese slices. Stir with a wire whisk until cheese has melted completely. Season with paprika, ground black pepper, and salt to taste. Add the cooked macaroni, stirring gently until completely pasta is completely coated with the cheese sauce. Simmer over low heat until heated through. Remove from heat. Buen provecho! 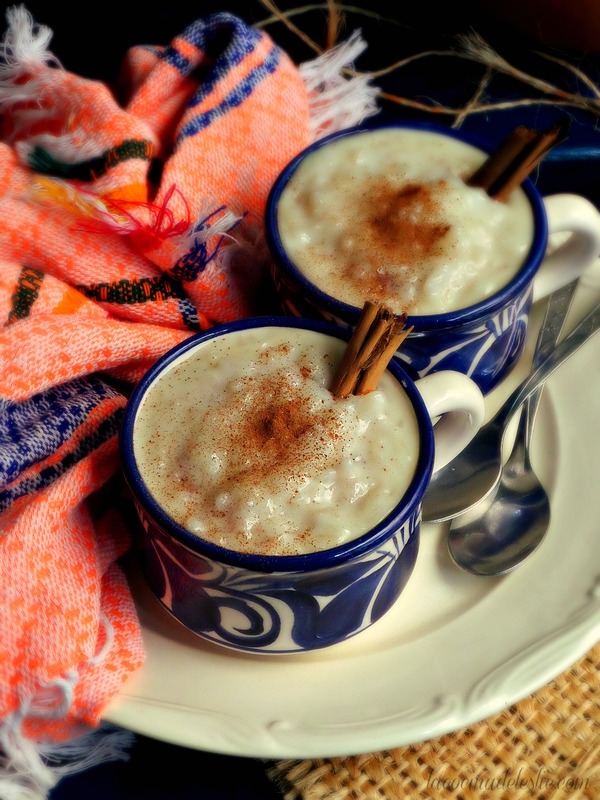 Arroz con Leche is the ultimate in Mexican comfort food. 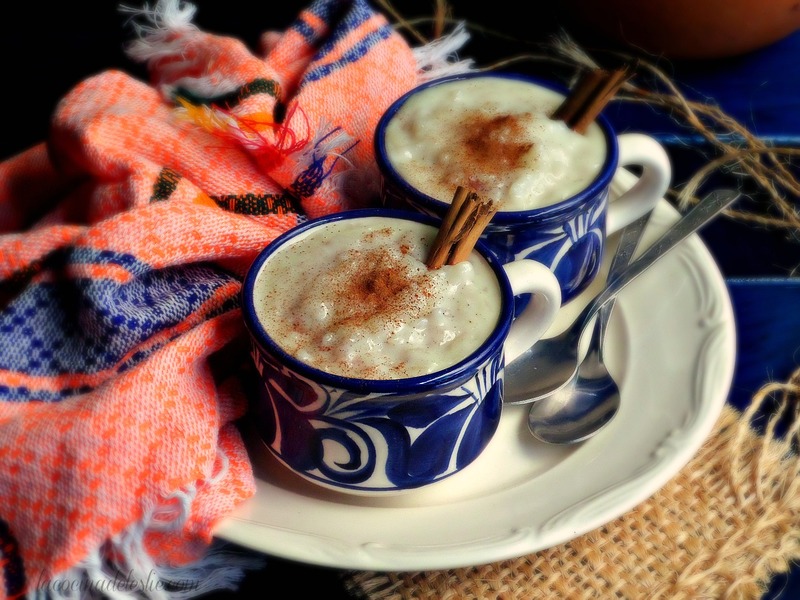 Creamy and delicious with a hint of cinnamon, this Mexican rice pudding is a warm and comforting hug in a mug. Every family has their own unique recipe for Arroz con Leche. Today I'm sharing the classic version, made with just rice, water, milk, cinnamon, sugar, and raisins, if you like them. There are other versions of Arroz con Leche that also include sweetened condensed milk and evaporated milk, which I'll be sharing soon, but today it's all about the traditional arroz con leche like our abuelitos (grandparents) and favorite tías (aunts) used to make. Stir in the 4 cups of milk. Cover, leaving lid slightly ajar; let simmer, stirring occasionally, for about 15 minutes or until milk comes to a boil. Sweeten with granulated sugar to taste. If adding raisins or dried cranberries, stir them in with the granulated sugar. Cover, leaving lid slightly ajar (to preven milk from spilling over); let simmer for an additional 15 to 20 minutes until rice mixture is thick and creamy. Remove from heat. Let cool slightly. Serve warm or let cool completely and refrigerate until ready to serve. Spoon rice pudding into bowl or coffee mugs. Sprinkle with ground cinnamon. Buen provecho! To help thicken your arroz con leche, mash the rice lightly with a potato masher. If your arroz con leche is still not creamy enough for your taste, dissolve the cornstarch in the cold milk. Stir into the rice pudding, and let simmer until desired thickness. 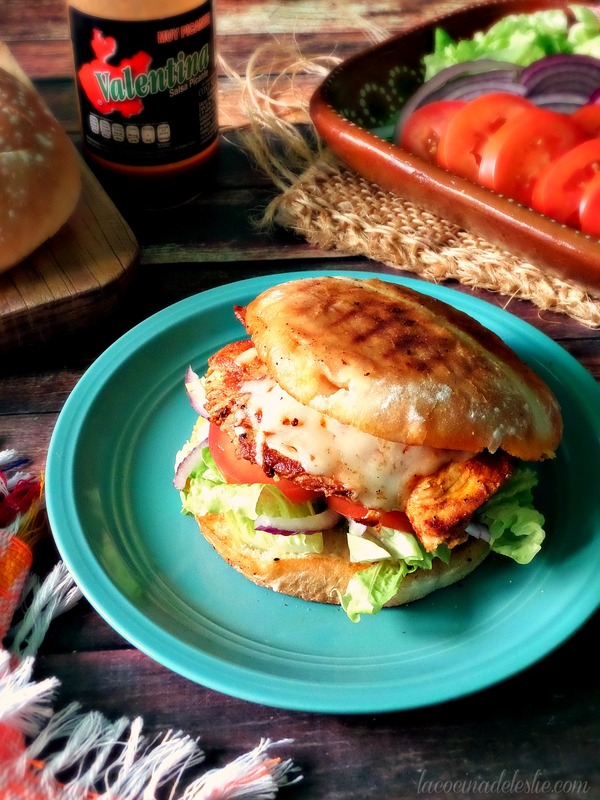 Spicy Valentina hot sauce marinated grilled chicken topped with Manchego cheese and served on a toasted telera or bolillo roll with lettuce, tomato, and red onion. It's National Sandwich Day and I thought what better way than to share this saucy and delicious Torta de Pollo Valentina. It's like a grilled Buffalo Chicken Sandwich, but with a slight Mexican twist by using Salsa Valentina, a staple in many Mexican kitchens. Traditionally, tortas are served on a toasted telera or bolillo roll, but any sandwich roll will work. 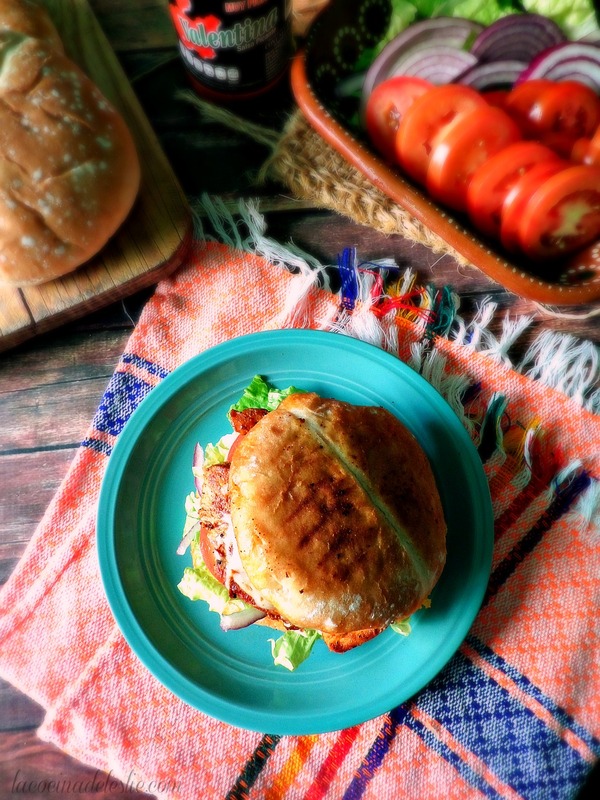 This torta is super easy to put together and can be ready in less than 30 minutes. You can marinate the chicken in the morning, before walking out the door, and it'll be ready to fry or grill when you get home. Once you try this Mexican buffalo chicken sandwich, you'll see why it's one of my go-to meals for when I need to get lunch (or dinner) on the table in a hurry. 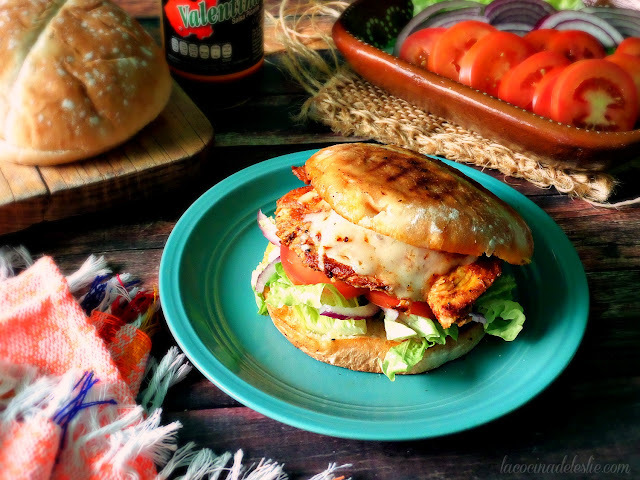 Spicy Valentina marinated grilled chicken topped with Manchego cheese and served on a toasted telera or bolillo roll with lettuce, tomato, and red onion. Arrange chicken breast cutlets in a large bowl or baking dish. Top with 3/4 cup of bottled Valentina hot sauce, stirring to combine, until the chicken is evenly coated. Cover with plastic wrap and refrigerate for at least 2 hours before using. Heat about 2 tablespoons of vegetable oil in a grill pan or large skillet over medium-high heat. Fry the marinated chicken, 4 to 5 pieces at a time, for about 5 minutes until golden brown. Turn chicken over, brush with a little of the remaining 1/4 cup of Valentina hot sauce. Top with about 3 tablespoons of shredded Manchego cheese. Cover grill pan and let chicken cook for 3 to 5 minutes until cooked through and light golden brown. Transfer chicken pieces to a heat-proof plate. Split open the telera or bolillo rolls. Toast in the same grill pan with 1 tablespoon of butter (optional) until light golden brown on both sides. Remove from heat. Spread cut sides of toasted rolls with Mexican crema. Layer lettuce, tomato, and onion on the bottom half of the roll. Top with 2 to 3 pieces of pollo Valentina and the top half of the roll. Serve with your favorite pasta salad or chips. Enjoy!